613 people read this post. The shopping complex known as Westgate mall in the Kenyan capital Nairobi is on everyone’s lips and every news agency appears to be covering the ghastly event that catapulted this unknown location into the headlines. The mainstream media has carefully crafted this narrative into one that has a limited timeline beginning on the 21st September 2013 and embedding key words such as “Islamic terrorism”, “insurgents”, “Al-Shabaab” and “Al Qaeda” establishing the foundation and terms of reference for any discussion. As the consumers of the mainstream are caught up in the natural expression of humanitarianism, empathy and concern; critical questions are marginalised. The most critical question being – what is the context of this ghastly event? It is crucial before engaging the context to establish the motivation for the Westgate mall attack. Various news agencies have indicated that Al-Shabaab via its official twitter account made it known that the motivation behind this barbaric act was as a result of Kenyan military intervention into Somalia. At no point in this statement was Islam or the defence thereof highlighted as a motivating factor. Yet, the mainstream media have been quick to insinuate the aforementioned with the use of key words such as “Islamic terrorism” and other derivatives of the same. The motivation behind the attack are firmly entrenched in politics and not religion, contrary to what the mainstream would wish the masses to believe. This incident has its roots not so much in our current times but can be traced back to a far more ancient period. These roots were briefly referenced by General Carter Ham, the former head of Africa Command during a press conference with South African journalists during March 2013 in Stuttgart. He stated “the last time the U.S. became militarily involved in Somalia, that didn’t turn out very well. This time, we applied a different methodology…”. This statement is a reference to the change in US military policy within Africa after the dramatic turn of events in 1993 popularised by the movie Black Hawk Down. The USA has been utilising military outfits such as the Joint Special Operations Command (JSOC) to liquidate targets within Africa and particularly Somalia. The words contained within the Shultz report regarding the failed mission of Special Forces over Mogadishu in which 18 Special Forces operators were killed are most telling. It said “The Mogadishu Disaster spooked the Clinton Administration as well as the brass, and confirmed the Joint Chiefs in the view that SOD should never be entrusted with independent operations”. The words of investigative journalist Jeremy Scahill regarding the Transitional Federal Government and AU troops are revealing: “…US-trained, -armed and –funded African Union troops.” The US military policy of using African countries as proxies to complete their ‘dirty work’ is evident. Even more so due to the establishment of Somalia’s “guantanamo” at Mogadishu airport which is run by the local authorities but access and interrogation governed by the CIA. The problems of Somalia, the rise of Al-Shabaab and the tragic consequences all have their roots in what the author and friend of the oppressed, Arundhati Roy described as “the task that never ends is America’s perfect war, the perfect vehicle for the endless expansion of American imperialism”. The establishment of the Islamic Courts Union (ICU) that deposed the CIA-backed warlords roaming Somalia was the first modern interpretation of stability and a democratic governance system in Somali post 1991. Interestingly, Al-Shabaab was part of the ICU, however remained a fringe movement and considered radical but was kept in check by the ICU. Enter 2006, the Head of US Central Command General (CENTCOM), General John Abizaid authorised the invasion of Somalia by Ethiopian troops supported by the US forces, air superiority and special forces operators to effectively topple the ICU. In the words of Jeremy Scahill, Al-Shabaab became the ‘vanguard’ against invasion and US intervention into Somalia. It was due to the external meddling in Somalia by the USA and its proxies that provided the platform for Al-Shabaab to rise to prominence. The use of AMISOM (African Union Mission in Somalia) bankrolled and trained by the United States to fight the US war against Al-Shabaab is the action that set the Westgate mall attack in motion. This is further compounded by the fact that the AU force is predominantly composed of the Kenyan troops as per a report carried by Al Jazeera. In 2011, the Shabella Media Network ran a story titled: “Somalia: MPs condemn AMISOM for shelling Mogadishu’s Populated Areas” indicating the mass atrocities that were perpetrated against civilians under the banner of AMISOM. The implications for Kenya, the use of its territory and forces for invasion, strikes against Somalia as well as its role within AMISOM were exposed by the New York Times in the same year carrying the following: “Over the past year, the American Embassy in Nairobi, according to one American official, has become the hive of military and intelligence operatives who are chopping at the bit’ to escalate operations in Somalia”. Furthermore, the dispatching of 5000 Kenyan troops in 2012 to Somalia leaves no doubt in the mind as to why Kenya was targeted. 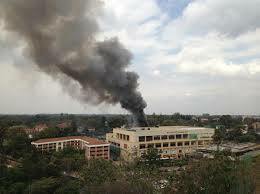 Indeed the tragedy of the Kenyan Westgate mall is a horrific loss of innocent life. However, the attack is merely a symptom of a far deeper problem. As the media continue to blow the trumpet of the Islamic terrorist threat the failure to recognise State terrorism that gave rise to such radicalism is a catastrophic miscarriage of objective reporting. The essence of the conflict is firmly vested in US militarism and the destabilisation of democratic structures. We have witnessed it in Mali; evidenced by their hibernation regarding the Egyptian military coup and we see it in Somalia with the ICU and the use of AMISOM to fight US imperialistic wars. It is only when foreign powers are expelled and we refuse to be used as pawns of imperialist powers will we see the end of the bloodletting by our own hands in our home, Mother Africa. Previous Reward of 100 Martyrs for Qurbani in foreign lands?